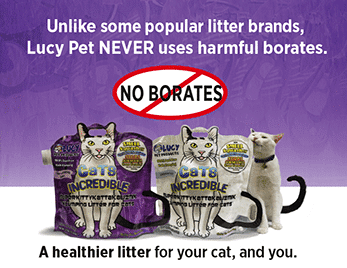 Cats Incredible Litter does not use borates of any kind. Unlike some other litters on the market, Cats Incredible litter does not contain forms of borate or boric acid. Borates and boric acid are used in such products as laundry detergent, fungicides, insecticides, and teeth bleaching chemicals. Studies have shown that borates can be irritants to the eyes and skin. Chronic exposure to borates can produce eye irritation, cough, and skin rash. Higher doses of exposure have been linked with seizures and convulsion. In some countries, including the European Union, borates are considered to be a class 1B carcinogen and mutagen and have been banned in the use of all personal and cosmetic applications. Therefore, we would not use borates in our Cats Incredible formulas. On 6/11/15, the European Chemicals Agency elected to include boric acid and sodium tetraborate or borax, to its list of chemicals of very high concern in Article 57 in Annex XIV of the REACH (Registration, Evaluation, Authorization, and Restriction of Chemicals) Regulation. The EU Chemical Agency has given these molecules the classification of Category 1B, carcinogenic, mutagenic or toxic for reproduction. 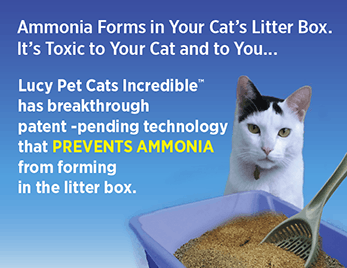 Ammonia is the main source of unpleasant litter box odors. Without ammonia, the litter box stays fresher longer, keeping your home smelling clean! Pet safe Cats Incredible is appropriate for use with all cats, even those with sensitivities. 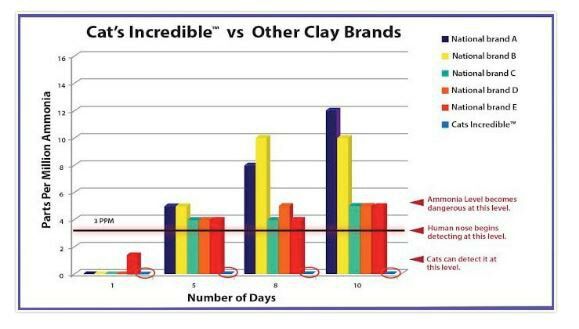 Cats Incredible is made with sodium bentonite clay, which cats prefer. Our ammonia-blocking technology also keeps finicky cats happy and consistently using their litter box. Ammonia quickly builds up in both ordinary clay and alternative litters. This can cause respiratory illness, digestive problems, and other ailments in cats. 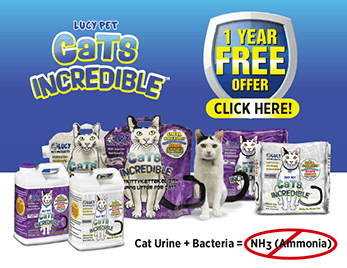 Studies show Cats Incredible kept ammonia at undetectable levels even after 10 days of use. 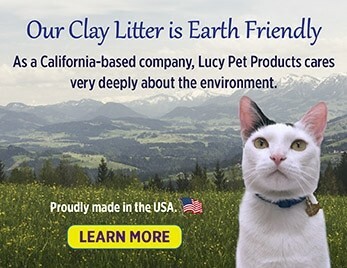 As a California-based company, Lucy Pet Products cares very deeply about the environment. We selected a partner with an outstanding environmental record to provide 100% pure Sodium Bentonite. 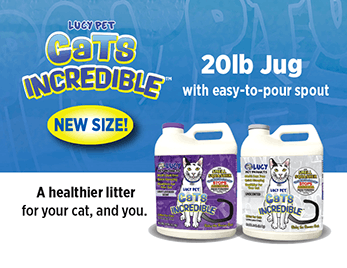 Each purchase of Cats Incredible supports the work of the Lucy Pet Foundation to reduce pet overpopulation through spaying, neutering, and adoption. Cats Incredible Litter For Cats prevents ammonia from forming in the litter box. Ammonia, the source of that pungent smell, is a health hazard that can be dangerous for both cats and people. 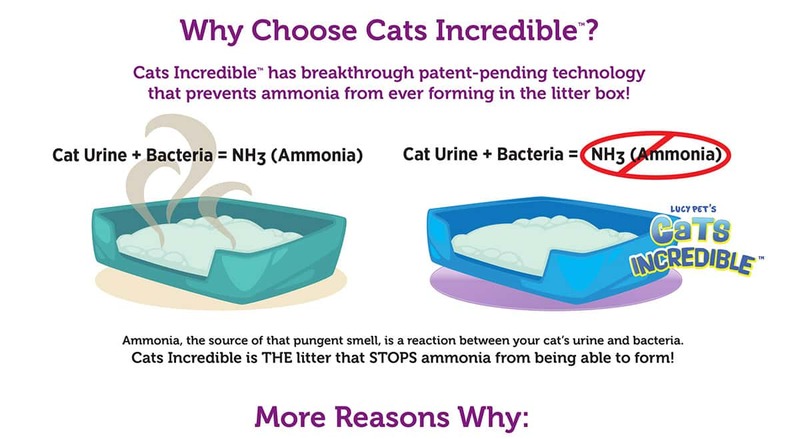 Cats Incredible is the only litter on the market that actually prevents ammonia from forming in the first place. Its patent-pending technology keeps your home healthy and odor-free. 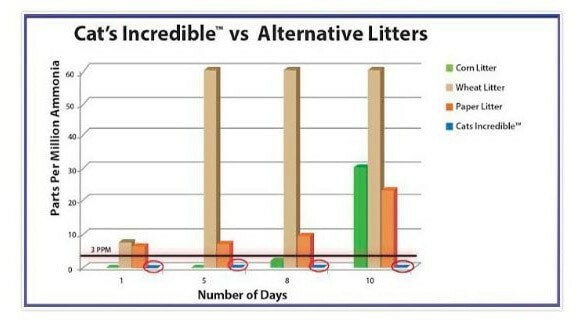 Independent Data indicated that even after 10 days of use, litter boxes with Cats Incredible™ litter did not have ammonia present. Other Brands had significant and dangerous levels of ammonia. Here’s how we rank against the major brands. Independent Data indicated that even after 10 days of use, litter boxes with Cats Incredible™ litter did not have ammonia present. Other major brands had significant and dangerous levels of ammonia. 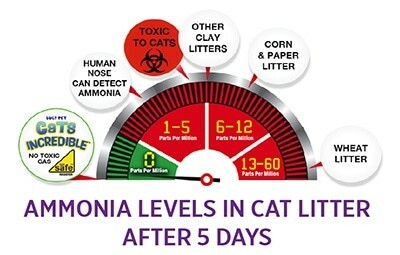 Ammonia is the silent pet KILLER! Environmental ammonia exposure is unhealthy for pets. Ammonia levels can reach as high as 15 ppm in 10 days if not cleaned properly. Ammonia levels can reach as high as 30 ppm in 15 days if the box is not completely cleaned out. Ammonia can be detected as early as 3 days after complete clean out of the box. The elderly become desensitized over time and do not detect the potent smell. Lucy needs a Nobel Prize for this cat litter. It is THE most AMAZING cat litter I have ever used. It’s the holy grail. You could leave this for a week (I have, not that I’m proud of it), and it will smell like nothing at all. Seriously. Zero smell in the room and zero smell in the box. The best. Thank you for enabling my laziness while indulging my need for the house not to smell like a cat! Lucy needs a Nobel Prize for this cat litter. It is THE most AMAZING cat litter I have ever used. It’s the holy grail. You could leave this for a week (I have, not that I’m proud of it), and it will smell like nothing at all. Seriously. Zero smell in the room and zero smell in the box. The best. Thank you for enabling my laziness while indulging my need for the house not to smell like cat! 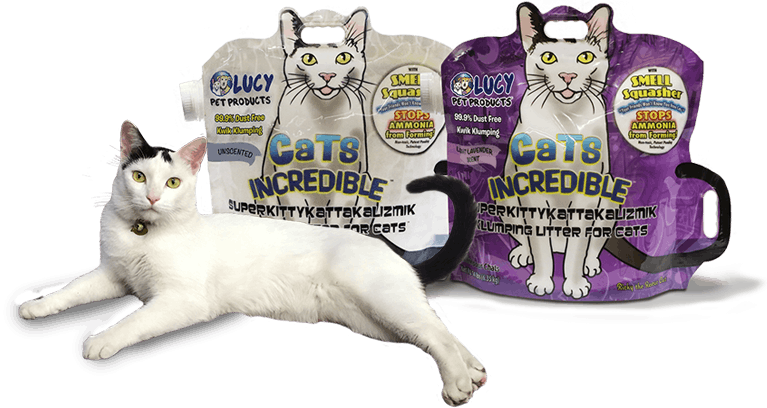 Cats Incredible is a wonderful natural litter that does not have the overwhelming chemical fragrance,which is often the case with so many litters. The quality of the litter is immediately evident. As a busy single mom, this litter has made my life just a little bit easier because even after weeks of use I only had to scoop the litter instead of changing the entire box. I cannot say enough POSITIVE about this product! We have two male cats that use one litter box. We’ve tried them all, clumping, clay, “best in the world” and not one of them are even close to this for being EFFECTIVE against odor! Ours is a two-story home, the litter box is upstairs in one of the bathtubs (in a bathroom that we don’t use much at all). We have an open area to the first floor and you could always catch a wiff of cat box until we discovered Cats Incredible. No more, now our home smells fresh all the time. I’ve already bought another bag of this because our local store runs out often. Thank you for such an amazing product that does what it says it does! I’ve been using this litter for the last 3 months and oh my God! My house used to smell like cats, everyone would tell me that. It was rather embarrassing. Lanae introduced me to this litter and it has been amazing. I have noticed that my cats actually like their litter box, and they seem all around happier. I am so thankful to have found this product. I will never go back to any other litter. Hi, my name is Sarah. I’ve got four cats in a very limited small space and I was absolutely blown away by the product itself, how it works, the odor control as well as the clumping factor, and the lack of dust that it has. I have spent forty dollars worth of good bags of litter and this just blows me away. Definitely a rebuy. I started using this litter the end of June and will NEVER go back to mass market litter again! As you know, I do a lot of work with rescue and rehabilitation of cats and prior to using this litter, I was having to completely change out all of my litter boxes at least 4 times a week and THAT gets expensive. Not to mention the smell that is associated with all of those litter pans. I was also continuing to have issues with upper respiratory infections on the cat’s that were really compromised, but never attributed it to the litter I was using. SINCE using this litter my rescue cats stopped with the chronic respiratory infections, I am able to just scoop the litter pans once a day and not have to completely change the litter boxes more than once a week. The smell is GONE, both in my cat rehabilitation area AND in my home. The litter is also soft on my older cat’s paws and he REALLY appreciates that! 5. Completely removed any ammonia smell, resulting in less upper respiratory infections. I truly feel it is the BEST litter on the market today! Simon, Annabelle, Bella, Q-Tip. Fluffy And the 6 other cats that I currently have in my “rehab room”! Also, my dog Chelsea thanks you because she doesn’t have to contend with cranky cats anymore! Join Our Lucy Pet Family!